We live life in one busy corner of the world here in our little, happy home. When you combine the daily hustle and bustle of two careers, keeping the kids on track at school, dance, violin, and life—and dealing with our less than cooperative Central Ohio weather blahs—things sometimes become a little stressful. While I am pretty scent-sensitive—there are a few scents that I love and take advantage of when behind closed (and locked) bathroom doors. I recently had the opportunity to enjoy a coconut relaxation kit (complete with Softsoap Coconut Island Quench, a yummy coconut candle, a new bath loofa sponge, and a massager) to help me create my Softsoap Coconut Island Quench Moisturizing Body Wash review. 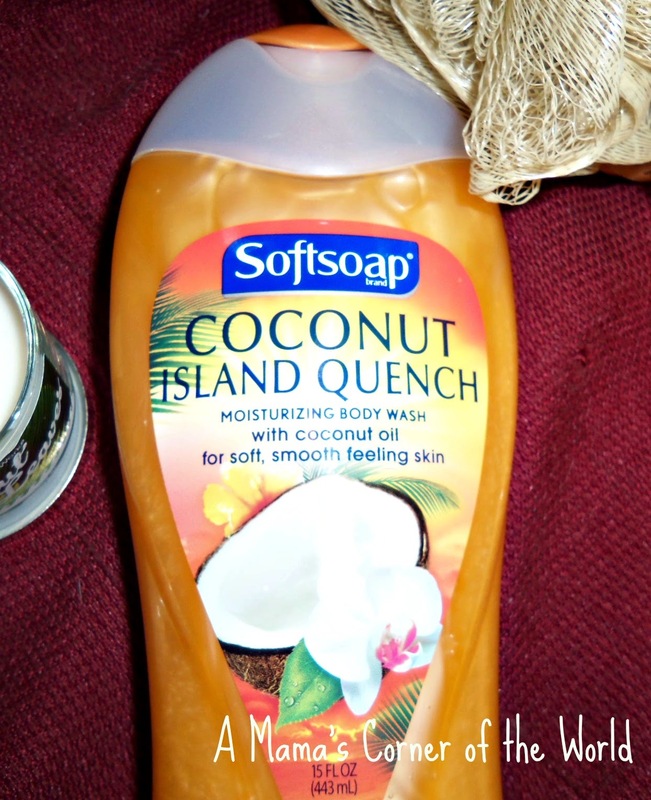 What did I think of Softsoap Coconut Island Quench Moisturizing Body Wash? Softsoap Coconut Island Quench performs well in the shower/bath. I often find scented bath and body washes drying—this one actually left me feeling less dry and tight-skinned than other scented washes I’ve tried. It lathers well—even well enough to shave without additional shave gel—rinses cleanly and leaves my skin feeling fresh. Would I recommend Softsoap Coconut Island Quench moisturizing body wash? Obviously, this is not an all-natural cleanser—so those of you who prefer those should move on to healthier options. For those of you who enjoy mildly scented body washes—especially those of the relaxing, tropical variety—this wash is mild enough for daily use and lightly scented enough that those of us with scent-sensitivities may be satisfied. Would you like to make it a spa inspired weekday break? These tips from Softsoap may improve your week! 7. Head to bed for a deep relaxing sleep!